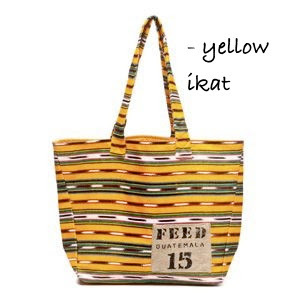 Feed Guatemala bag in Zebra Ikat, $45. When we think about hunger countries like Somalia, India and Ethiopia come to mind. But hunger and malnutrition prey on everyone even Americans. FEED is a nonprofit organization that creates products that help feed the world. It was founded by Lauren Bush in 2006 and has provided over 66 million school meals to children all around the world, 46,000 nutrition supplements and has reached over 13,000 American children. And the numbers keep rising. What FEED is doing is much more than feeding kids. They are allowing children to be children again. They are helping them focus in school, giving them the opportunity to work their way out of the poverty they were born in. They are restoring hope and investing in the betterment of the communities they serve. WHY BUY PRODUCTS THAT FEED? 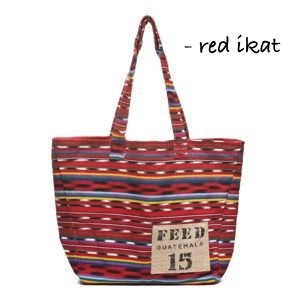 Each FEED Guatemala Bag will provide 15 school meals through the UN World Food Programme (WFP). 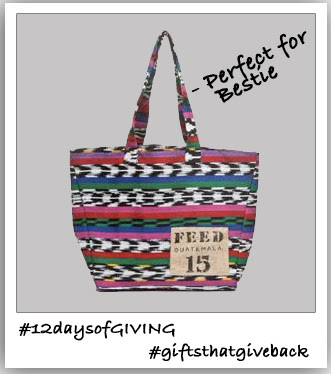 The FEED Guatemala Bag is handmade in Guatemala by Nest, a nonprofit organization that empowers artist and artisans around the world, using traditional Ikat fabrics. This could be the perfect gift for your socially and fashionably conscious best girlfriend. It is environmentally friendly and will make a great carryall bag for strolling around on the weekends. *World Food Programme's Facts Blast; Nov. 2010. Taken from Feed website.